: Dog for hunting especially the hare and the wild boar. : The origins of the Segugio go back to the highest antiquity. These dogs are certainly descendants from the primitive hounds of ancient Egypt, used for hunting game. They were subsequently introduced along the Mediterranean coast by Phoenician merchants and finally arrived in Italy. Numerous drawings executed under divers dynasties of Egyptian Pharaohs bear witness to the presence in Egypt of dogs very much resembling the present Segugio. Lets point out in particular the presence of hanging ears, indubitable sign of an advanced domestication. 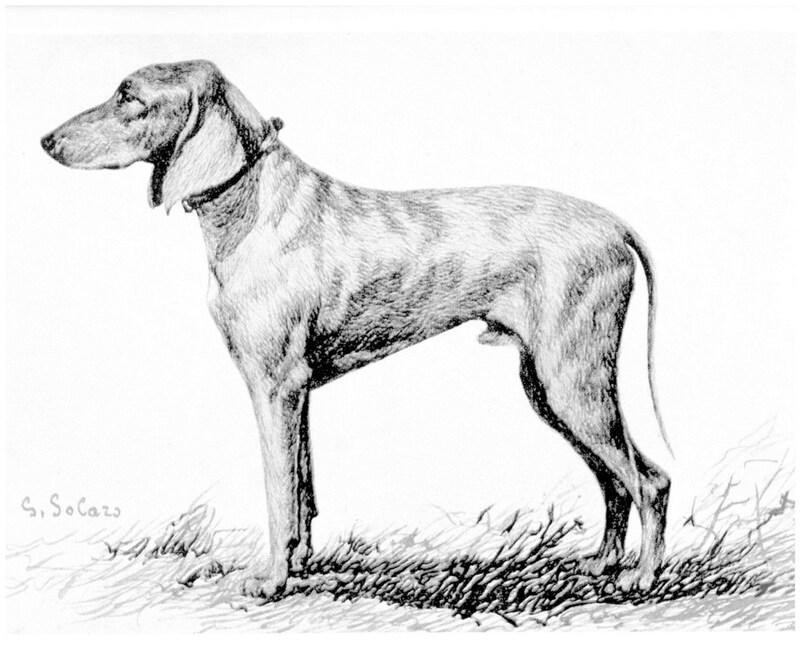 We may therefore deduce that the ancient dog for the scent-hunting game, which should not be confused with the sight-huntinghounds, landed in Italy and gave birth to the present Segugio, whose general anatomical particularities have been maintained practically without change through the centuries. Dogs of the same type and stature as the present Segugio figure on statues of "Diane the huntress" (Diane chasseresse) in the Naples Museum and that of "Diane with bow and arrow” (Diane tirant à l’arc) in the Vatican Museum. In the castle of Borso d’Este (1600) we can see a painting which represents the ideal type of the present Segugio. : Dog of generally medium proportions, the body of which fits into a square; of robust construction, well balanced, with well developed bones, lean shapes, provided with good muscles without the least trace of fat; longish head of which the upper longitudinal cranial-facial axes are divergent; short hair coat. : Scenthound well adapted to the most varied terrains; endowed with a great resistance and good speed, is extremely eager, whether working alone or in a pack; of a hardy temperament but not very effusive, has a soft expression and a resonant very pleasant voice. : Seen from above, the shape of the skull is nearly oval. In profile, the axes of the skull and the muzzle are divergent; the upper profile of the skull is slightly convex; the bi-zygomatic width is inferior to half of the length of the head; the superciliary arches are barely developed; the frontal furrow is only slightly marked; the occipital crest, neat and prominent without exaggeration, is short. Stop Degree of accentuation of about 140°. : Nearing the shape of a polyhedron of six faces, sufficiently large, mobile with well opened nostrils; the openings are slightly lateral; always black. : The length of the muzzle is equal to half the length of the head; its depth must exceed by a little half its length; the width of the muzzle, measured at mid-length, must be a bit inferior to the fifth of the length of the head; the upper profile of the muzzle is slight1y convex (Roman nose), the lateral faces of the muzzle converge towards the front; the branches of the lower jaw are almost straight in their entire length and the body of the jaw is only slightly developed in front; the lower lateral profile of the muzzle is defined by the upper lip. : They are fine and thin; seen from the front as well as in profile, they are not greatly developed in height (taut); in profile the upper lips show at their lower edge a slight curve. The rims of the lips are always black. : The shape of the jaws is like that of a truncated cone; the position of the incisors in relation to the jaws is at right angle, with scissor bite. Teeth complete and white, regularly aligned and normally developed; scissor bite is correct, pincer bite is permitted. : Almond shaped, large, luminous, of a dark ochre colour, in semi-lateral position, with soft expression; the rims of the eyelids are always black. : Set at the level of the zygomatic arch or slightly lower; the leather must be hanging and shows a torsion which draws the entire leather forward, not allowing it to fold over, or to curl. The leather is of triangular shape, flat in its entire length and very wide; the point of the leather must end in a narrow point; it is never widely rounded; tip with a very slight internal volute. The length of the leather must reach about 70% of the length of the head, and its width, at the broadest point, measures a little more than half its length. : Upper profile slightly arched, therefore slightly convex. Its length corresponds or is almost equal to the length of the head, therefore must reach the 4/l0ths of the height at the withers. The neck has the shape of a truncated cone; appears very lean and light, giving the impression of not being very muscular (long muscles). Skin: Fine, close fitting, without folds or dewlap; short hair. : Straight topline which from the withers descends harmoniously towards the croup with a modest convexity at the level of the lumbar region. : Only slightly raised over the topline and narrow due to the closeness of the shoulder blade points ; fusing harmoniously into the base of the neck. : Upper profile of the back straight with muscles not very apparent; the length of the back is in relation of 3 to 1 with the length of the loin. : The length of the loin measures a bit less than the fifth of the height at the withers; the width of the loin is close to its length; muscles of the lumbar region are well developed in length and in width. : Upper profile of the croup shows a slight convexity; its direction shows an inclination below the horizontal of about 10°; its length reaches about one third of the height at the withers and its width measures about half its length; muscles are well developed. : The height of the chest or ribcage is equal or slightly less than half the height at the withers, and its width (transversal diameter), measured at mid-height, is equal to about 1/3 of the height at the withers; the chest must go down to, or nearly, the elbows. The ribs are not greatly sprung, so slightly convex; the circumference of the chest being superior to the height at the withers by a quarter, the chest is of moderate width. : The profile of the underline is typical in the way that it presents itself in a straight line in its entire length, which, from the sternum, ascends to the belly; belly very lean, even if not greatly tucked up. : Set on high on the line of the croup. Thin at the base, and uniform throughout its length, resembling a “grissino” (small bread stick) except for the tip which is very fine.The length of the tail is so that the extremity touches or almost reaches the point of the hock. Covered with short hair in its entire length. At rest, the tail just hangs; when the dog is in action, it is raised above the back line. : On the whole, seen in profile, the perpendicularity must correspond to an imaginary vertical line drawn from the scapulo-humeral articulation down to the ground, which just touches the tip of the toes, and to another imaginary vertical line, going from the humero-radial articulation, which divides the forearm and the carpal joint in two almost equal parts, and ends at mid-length of the pastern, Seen from the front, the foreleg must correspond to a vertical line which goes down from the point of the shoulder and divides the forearm, the carpal joint, the pastern and the foot in two more or less equal parts, The height from the ground to the elbow is equal to half the height at the withers. : The length of the shoulder blades reaches the third of the height at the withers; their slope below the horizontal is of 45° to 55°; the muscles are long and lean, apparent and well distinct; , opening of the angle of the scapulo-humeral articulation is of about 110°. : Its length corresponds to about half ; the height from the ground to elbow; in relation to the vertical, it is situated in a plane more or less parallel to the medial plane of the body. Arm muscles are long and lean. : Placed at level or slightly below the sternal line and parallel to the medial plane of the body; the point of the elbow must be on the descending vertical from the point of the shoulder blade. The humero-radial angle measures from 135° to 145°. : Its length measures about a third of the height at the withers; is perpendicular to the ground and shows a well visible carpo-cubital groove, which gives the impression of a lean leg, fleshless and not heavily boned. : Lean, extends the straight line of the forearm. : Its length must not be inferior to the sixth of that of the foreleg from the ground to elbow; wider than the carpal joint, but flat and lean; seen in profile, the pastern is slightly oblique from back to front. : Oval shaped (hare foot) , toes tightly closed and arched; digital pads not very fleshy; communal pad lean, hard, tough (leathery) and black. Nails strong, curved and always black. The presence of some white (not pink) nails is not a fault. : Less oval than the front feet of which they have all the characteristics. : Seen in profile, the perpendicularity must correspond to an imaginary vertical, which goes from the point of the buttock to the ground, touching or almost touching the tip of the toes. : Long and wide, its length is not inferior to a third of the height at the withers. Its width (external face) is almost equal to 3/4 of its length; muscles are prominent, but clearly separated; the back edge of the thigh is a little convex. The angle of the coxo-femoral articulation measures 90° to 95°. : The stifle must be on a vertical with the hindleg, therefore should not turn either out or in; the angle of the tibio-femoral articulation is of about 115°. : The length of the lower thigh is slightly less than that of the upper thigh; its slant below the horizontal is about 40°. The lower thigh shows lean muscles even in its upper part, firm and clearly distinct one from the other; the leg groove is well marked and apparent; the outer saphenous vein is visible; bone structure rather light but very solid. : Its width is more or less equivalent to the tenth part of the height at the withers; the distance from the ground to the point of the hock must not exceed the 27% of the height at the withers (low hock); the bone structure is solid with the bony outline clearly visible, which underlines the leanness of the leg; the opening of the tibio-femoral angle is of about 135°. : Its length is inferior to half the length of the foreleg measured from the ground to the elbow; less wide than the hock, set in a vertical position, i.e. Perpendicular to the ground. No dewclaws. : When hunting, the dog gallops. : Fine and thin, close fitting all over the body. Pigmentation of the mucous membranes, third eyelids, nails, communal and digital pads must be absolutely black. A black pigmentation of the palate is not essential, but highly desirable. : Short hair all over the body; straight horse hair texture, dense, close and uniformly smooth; there may be a few scattered coarse hairs on the body, on the muzzle, also on the legs which does not constitute a fault. : The permissible colours are solid fawn in all of its graduations from intense red fawn to the faded (washed out) fawn, and the black and tan. The tan markings, as in all black and tan dogs, should be on the muzzle, eyebrows, the chest, on the legs, from carpus to foot and tarsal to foot, also on the perineum. The fawn dogs may have white on the muzzle and the skull, (symmetrical mask or not), a white star on the chest, white on the neck, the pastern, hocks, on the feet and the tip of the tail. The white however is not desirable and the less there is of it the better. The black and tan may show a white star on the chest; in that case the Segugio is called tricolour. The chestnut brown colour including liver is not acceptable. Males from 52 to 58 cm, females from 48 to 56 cm. Tolerance ± 2 cm, only for excellent subjects. : From 18 to 28 kg. Slate or lead colour; brindle dog; coffee, chest-nut brown, liver or when whits predominates.